I was wondering, is there such a thing as an ‘underground’ film anymore? Does a subculture exist wherein the experimental, the culty, the non-mainstream can thrive, enclosed within an echo chamber of shared ideologies and elite glamour; that Warhol/Morrisey sort of happening where filmmaking is a communally esoteric endeavour and usually part and parcel of a wider movement? I don’t think so, myself. The means of mass distribution and a world-wide communication system has gone and taken the cliquey cool out of it all. I used to envisage films like Multiple Maniacs playing in scuzzy flop houses (tbh I’m not even sure what a flop house is, really), with colourful bohemians getting up to all sorts in the flickering dark, and imagined how insanely cool it would be to be part of that ‘scene’ (any scene, really). Of course, now Multiple Maniacs is available in all its unwatchable glory on a Criterion blu-ray, and if I wanted to make an eight hours and five minutes slow motion film of, say, an unchanging view of Caerphilly Castle to make a vague comment upon the passing of time I could have it uploaded (to mass acclaim) on Vimeo within moments of cutting it. 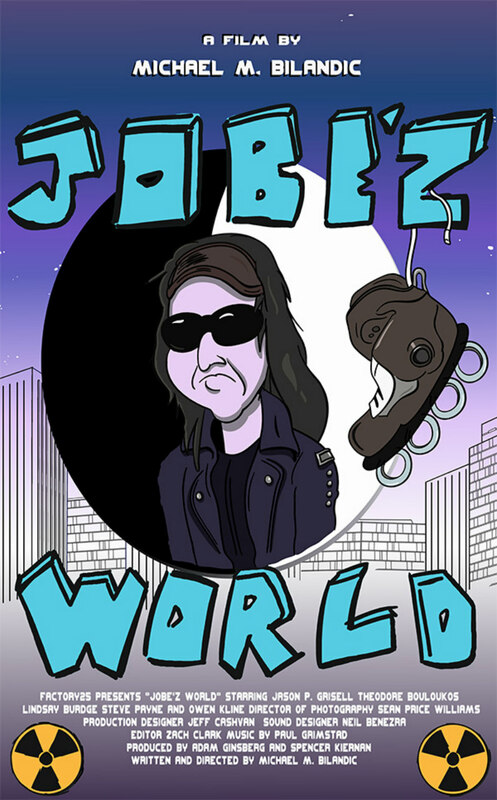 Michael M. Bilandic’s Jobe’z World is not as avant-garde as all that, but it does display a hipper than thou poise which places it firmly within the realms of self-consciously niche appeal. We follow Jobe (Jason Grisell), a middle-aged rollerblading drug courier as he slices about Manhattan delivering the street drug ecstasy (or 'molly', as the Americans insist on calling it) to various oddbods and eccentrics, one of whom is a famous ham of an actor who ends up dying, a crime which, through unlikely plot contrivance, Jobe gets the blame for. The sort of people that Jobe meets are lively and harmless eccentrics: a bloke on Brooklyn bridge who catches fish from the Hudson at midnight, another chap who has kitted out his basement dwelling as an underground bunker, etc. The film’s cartoony approach to NY nightlife is explicated early on by Jobe“z” voiceover, "dusk is the most electric time of day, when the true derelicts and homeless let their hair down.., the night should be for partying." Eh? As if the mass homeless and destitute of inner cities are really super-hip good time guys and gals, biding their time for the cover of night before they begin raving. Don’t let the Daily Mail find out! A naïve or dangerously patronising representation? 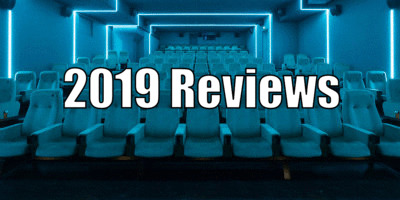 Well, seeing as the film opens with a monologue about constellations, galaxies and our insignificance within the cosmic infinity, related in the know-it-all monotone of someone who only very recently discovered psycho-active drugs, lets plump for the former. Drugs and cities, eh? Like Jobe as he skates about the Big Apple, the film itself coasts upon the glitzy reputation of this town and its exciting mythologies. But could there be an intriguingly sad subtext in Jobe’z World which pertains to how each of Jobe”z” customers are solo flyers, imbibing this most social of all drugs within the lonely confines of their home? It’s unclear. 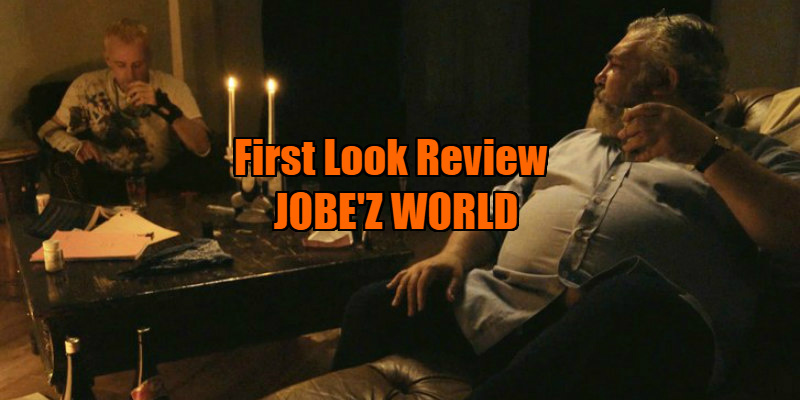 Jobe’z World aspires towards an amateur reproduction of Scorsese’s After Hours (love that film, and bring back Linda Fiorentino), but with none of the screwball farce which powered that particular oddity. As Jobe goes into hiding after delivering a fatal dose of a drug which is apparently more powerful than "what killed Prince" (dare take His name in vain), he affects a costume of black coat, shades and a dark flowing wig, making him look like nothing less than a Tommy Wiseau cos-player; an intertextual reference which is a more apt indicator of Jobe’z World’s eminence.